really angry courtney. i was just bored,and i don't hate gwen.she's my fav. Wallpaper and background images in the আমাদের নাটকের মঞ্চ club tagged: tdwt. This আমাদের নাটকের মঞ্চ fan art might contain নকল মানুষের, কমিক বই, কমিকস, and কার্টুন. 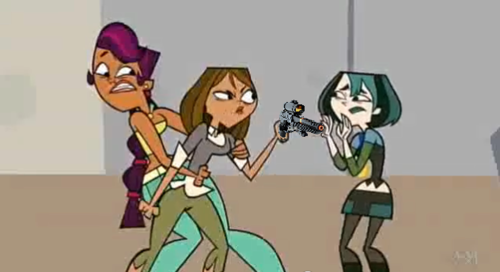 Me:*approaching Courtney slowly* Give me the gun, Courtney. We can talk about it like adults. 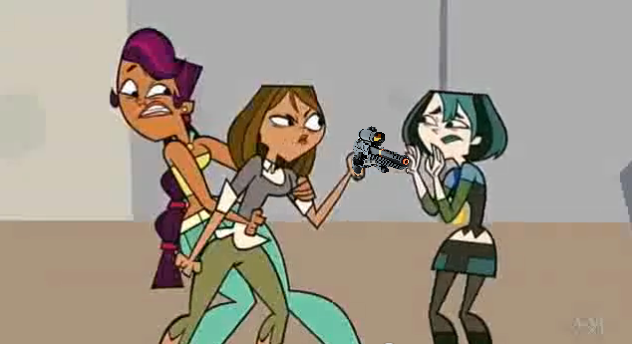 *slowly grabs gun* :)*quickly points gun at Courtney* Aha! Surprise attack! *points gun to ground* I'm just kidding. Me:*points gun at Courtney* Or maybe I'm not! Me:*points gun to ground* Just playing with you, Courtney. Me:*points gun at Courtney* Or am I! JK...but seriously. Awesome picture...kinda..not really...jk...or am I? I am..not really...jk...now I'm confused! Seriously, good pic. Sorry for the long comment. Aww, poor Gwen! At least Sierra's pulling Courtney back, lol. Courtney won't kill Gwen and noah you won't Courtney would kill you she is the one with the gun. i'm sorry, but Courtney would NEVER kill a person. she said in Basic Straining, "i'm going to be running for office one day" she means that she's going to run for president or something. it won't look good if someone puts up a file of her doing 2nd-degree murder, which is illegal. Look at her in the picture DandC4. pie4me: you do realize that this isn't a screencap, meaning that TDI_FAN_SKIDZ just added that gun in there, cause she was bored, meaning that THE GUN WASN'T IN THE ORIGINAL SCENE! so there. TDI_FAN_SKINS: i know, this is just coming from a MAGOR Courtney fan. @DandC4evacute: TDI_FAN_SKIDZ is a boy. oops. oh well. hope you don't take this personally, TDI_FAN_SKIDZ! just a mistake.